Aspiration is a financial firm with a conscience with the mission of democratizing financial services with a business model built on fairness, sustainability, and trust. Aspiration’s bank account was selected by Money magazine as the "Best Checking Account" in America because of its high interest rate and no fees including no ATM fees. It also offers the Aspiration Impact Measurement (AIM) which shows people the sustainable impact of their spending on People and the Planet. Aspiration’s core investment fund is a 100% fossil fuel-free, 100% firearm-free strategy that backs companies with exemplary environmental, employee, diversity, and governance practices. It has consistently beat the S&P 500 and performed in the top 1% of all large cap mutual funds in America for the past year. Aspiration’s Pay What Is Fair model trusts customers to choose the fee they believe Aspiration deserve – even if it is zero. 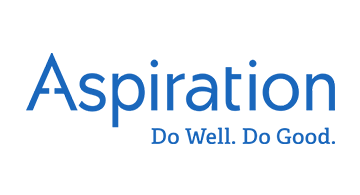 And Aspiration is also the most charitable financial firm in America donating 10% of its revenue to charitable causes – specifically around microloans for Americans living in poverty. Aspiration was selected by Fast Company as one of the 50 Most Innovative Companies in the World. As importantly, we were in their Top 10 for Most Innovative in both Finance (#4) and in Social Good (#3). It is also one of Inc.’s 25 Most Disruptive Companies in America and Entrepreneur’s 100 Most Brilliant Companies.